Hey there, can you believe 2016 is almost over? I can't, it seems to have flown by, but it looks like for many, not fast enough. I was looking on Facebook this morning and saw a "Tribute to all we have lost in 2016" and wow! So many famous names, with the latest being Carrie Fisher (aka Princess Leia) and now her mom, Debbie Reynolds. So sad for sure. But, on a happier note, with the end of 2016 comes the Year End Clearance sale! You still have a few days left to take advantage of the this great sale. I also have some exciting things happening here at SnS From the Heart that I want to share with you. First of all, I am participating in a Blog Hope with 18 other very talented demonstrators tomorrow night, the hop goes live at 8pm EST. and all you will need to do is follow the link at the bottom of each post to take you to the next one in line. Talk about some GREAT, AWESOME ideas from the new Occasions catalog mixed in with some of our favorites that will be leaving us in a few days. Second exciting happening, I am offering my first ever Class to Go by mail! Be watching for my newsletter in the next couple of days which will contain all of the details. And if you aren't already on my newsletter, be sure to sign up. It's easy, just add your information over to the right of the screen and you will be added. You will also receive a free tutorial just for signing up. In addition, along with news and announcements in my newsletters, I include free downloadable tutorials and goodies. So, don't miss out. But this Class to Go has me so excited. 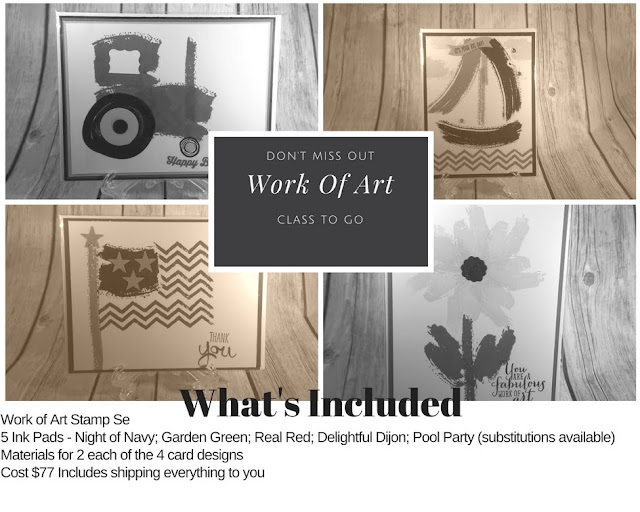 It includes the Stamp set Work of Art, 5 ink pads and all of the materials needed for creating 2 each of 4 different designs. It also includes the PDF written instructions for each card design (there will also be a bonus PDF for a 5th card design) and a video tutorial for each. You will get all of this for just $77 and this includes shipping everything to you. I have pre-selected the ink pads, however, if you already have any of the colors, substitutions are available, you will just need to let me know when you register for the class which colors you would like. If you already happen to have this awesome stamp set, I have an option for you as well, you can purchase just the PDF and video instructions for $30, that's a total of 5 PDF written instructions and 4 videos for $30. Again, watch your email over the next couple of days for all the details. So, what do you think? Are you excited? I know I am and I hope to bring many more classes to you just like this one. Leave me a comment below and let me know your thoughts.